Optometric vision therapy is a program of progressive visual activities performed under doctor supervision, individualized by the vision therapist to fit the needs of each patient, usually conducted twice a week with supplemental home support activities between office visits. Activities are designed to help patients develop or recover fundamental visual skills, improve visual comfort and efficiency, and enhance how patients process visual information. For a brief WebMD video from a colleague's office near Atlanta,click here. Some are high-tech, like a 52-inch computerized touch screen with dozens of various programs, or LED goggles for 3-D vision. Some are low-tech, like a ball suspended from the ceiling by a rope, or designs out of blocks of differing shapes and colors. And some are just plain weird, like polarized pictures that appear to move and change in size in unexpected ways, or prisms that make straight things look and feel curved. 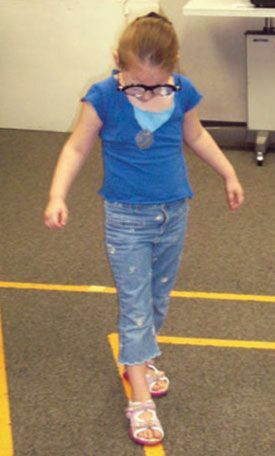 The variety of activities allows a trained vision therapist to adjust from moment to moment during each therapy session, quickly responding to each patient's needs. As patients improve, the level of each activity is raised, and more challenging tasks are introduced.